The design process:The design was divided in four distinctive styles. For the back of the house, the design evolved around the stone well. 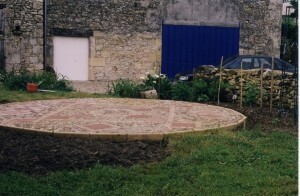 The hardlandscape would have a circular theme with gaps in between the paving for planting. Clipped boxes, Santolina and lavenders would be placed around architectural and multi-stemmed trees, inspired by the work of Nicole the Vesian. The front of the house she built a driveway that divides the property into two areas. To hide the driveway I suggested planting the edges of the driveway in a informal style. Two rows of fruit trees would be planted on either side of this garden. 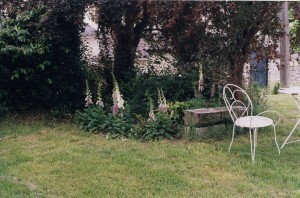 Two large border would be planted with large shrubs and herbaceous in between the fruit trees. In front of the kitchen garden, a large lawn area would be developed. All around the lawn, grasses, small trees and perennials would be planted in large drifts to give a modern atmosphere. 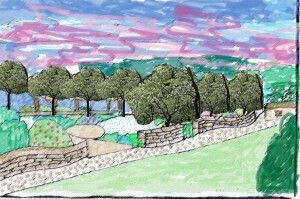 On the far end, the garden slopes and a stone wall rises around a tree and retain the soil. The wall continues around the edge of the property, curving and jumping as a sculpture. 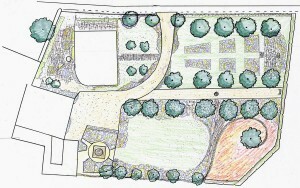 In between the traditional and modern garden, an alley of fruit trees would be planted to divide the two gardens. The fruit trees would be under planted with bearded irises.